IPP offers a full line of RF Microwave in-phase power dividers and combiners in various split ratios, frequencies and power levels up to multi-kilowatts. 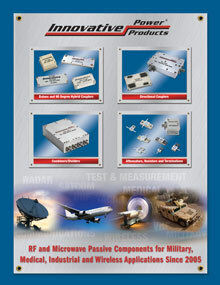 RF power dividers and combiners are available in connectorized packages as well as drop-in and custom configurations. IPP Combiners / Dividers offer low loss and VSWR while providing port-port isolation through the use of IPP’s high power resistive products. These power dividers / combiners are designed to be screw down mounted to a heatsink. These products are available in narrow and broadband bandwidths making them ideal for applications including, power amplifier, antenna feeds, attenuators and switches. Frequency Range is from 2 MHz to 6000 MHz in power levels up to 2500 Watts.